I've been enjoying the hell out of my Audible subscription (seriously, it's so great) and have been using it, and Multnomah Country Library's rad digital downloads system, to check out books that I've heard mixed things about seem polarizing in some way. It's a fun way to explore books I'd maybe otherwise pass up. It's hard for me to write lengthy reviews of audiobooks because I don't retain details quite as well when I'm listening. But I thought I'd share some brief reflections on some books I listened to recently. Salvage was made for the audiobook format, I swear. The first person point of view is from the perspective of Ava, a girl who's lived her life on a polygamist interstellar spaceship. Because her life has been in isolation from Earth, her ship has a distinctive dialect, which the book is written in. I often have trouble with dialect when I'm reading, but in listening it doesn't faze me. This is a weird, but inventive story, moving from an oppressive spaceship to the chaotic world of futuristic Mumbai. If you're looking for more diversity in your fiction (which I highly recommend), Salvage is a great example of how genre fiction can be a fantastic vehicle for creating diverse worlds. Feminist readers will love the complicated, nuanced commentary on gender dynamics--it's far more complex than many other books I've read labeled as feminist reads. Again, this shows the way genre fiction can push boundaries in a different manner than "realistic" (yet another term I have issues with) fiction often does. Kristing Hvam is probably my favorite audiobook performer. She narrates a slew of books, and brings a special quality to each one, so obviously I had to snag the third book in Laini Taylor's Daughter of Smoke & Bone series when it popped up in my library's digital downloads collection. First of all, this book is long. Like, 18 hours long. If I'd know this, I may have reconsidered the audio format. I primarily listen to books when I'm driving and it's rare I'm in the car for more than thirty minutes at a stretch and I don't drive every day, so you can imagine how long this took me to finish. With that said, the best thing about the audio format was that it really forced me to pay attention to the way Laini uses words. She's just so clever with descriptions and dialogue and the subtleties of sentence construction that it was a pleasure to listen to her writing for 18-plus hours. Note: I actually skipped the second book in this series because Laura warned me that there were a number of elements that would bother me, but because she explained the events of the second book to me, and I did a bit of a Wikipedia refresher, I was fine. This series came highly praised by Nafiza, who always has interesting recommendations. If you're a fan of, say, The X-Men, this series will probably float your boat. It's action packed, but also asks big moral questions that never have easy answers. While The Darkest Minds sets the stage, it's in the second novel, Never Fade, where the series really shines. I can't wait for the final installment in the trilogy, out later this year. 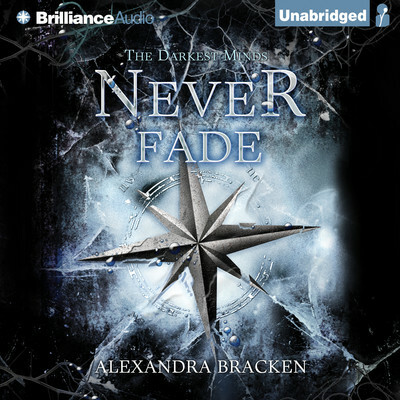 I like this narrator--I've listened to a couple other books she's performed. However, I do have an issue with the way she performs most (or perhaps all) of the non-white characters, who don't have any textual indication that they speak with an accented English, and yet they're performed with an accent. It seems like a strange production choice. Because of this, I'm torn as to whether I'll go with the audio again for the third novel. The only truly good thing about this book was the narrator, who was great and I would look for again. She actually sounded like a teenage girl and hit the verbal cadences just perfectly. Unfortunately, everything else about this book was frustrating. I had big issues with the plotting and character motivation, use of the death row prisoner as a plot hook without ever giving him a voice and the execution of the semi-epistolary format. And, the author assassinated the character of one of the love interests to justify some fairly crappy behavior on the part of the main character. I actually feel kind of terrible about my not-great feelings about The Ward. The voice is fantastic and the first half of The Ward is very gripping. It's got a wonderfully-diverse cast and a girl who's a badass street racer. However, the pacing was rather jarring and inconsistent, there are a couple of inexplicable breaks in character that left me asking wtf, and it needed about 150 pages simply cut to create better flow. I may check out the sequel, because I am curious where the story goes. This has a feel similar to Legend (though it's a very different story), so if you liked Legend (which wasn't really my thing), this may appeal to you. The narrator's tone and voice was great on the audio edition of The Ward, which is one of the primary reasons I stuck it out. This is just a really fabulous southern family story that I can't tell you a whole lot about plot-wise without ruining, but it's kind of twisted and funny and still heartwarming. The narration worked really well for me; the southern accent didn't sound overdone, and she nailed the timing with the comedic moments.